Although it looks like an energy disaster, it's actually benign. Most people who care about airtight ceilings have learned to cringe at the sight of a recessed can light. 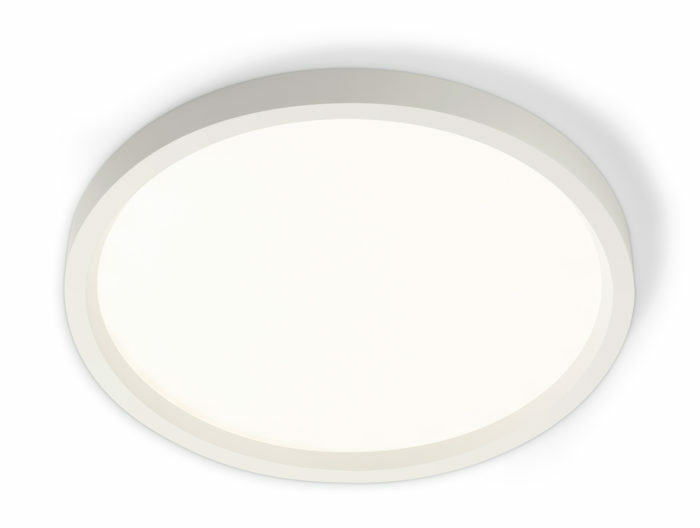 However, there's no need to cringe when you see this new LED fixture from Philips: although it looks like a recessed can, it's really a surface-mounted fixture. Image Credit: Philips The SlimSurface LED fixture fits inside a shallow electrical box. 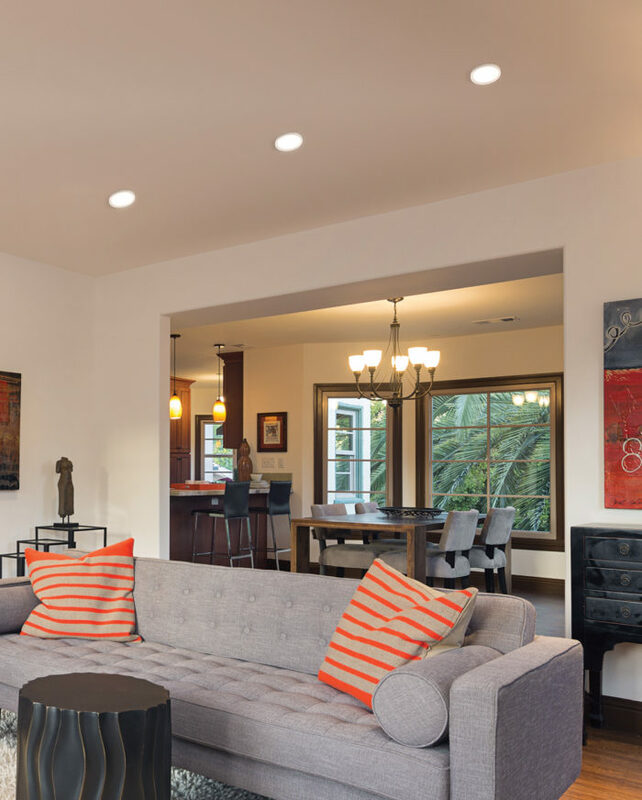 Image Credit: Philips Three SlimSurface LED fixtures installed in a living room. Recessed can lights have gained a reputation as the go-to fixture for inexpensive downlighting. But they have their drawbacks. When placed in an upper ceiling and not sealed and insulated, they can bleed energy. When improperly insulated, they can present a fire hazard. One answer from Philips, released this week, is an ultra-thin surface-mount LED fixture designed to look like a recessed can when viewed from below. 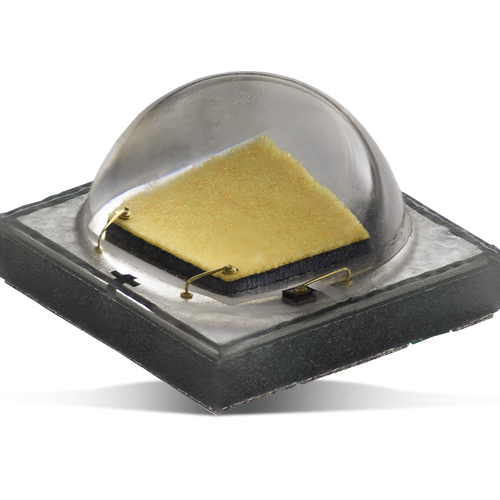 Measuring only 5/8 inch deep, the SlimSurface LED can be mounted in a shallow electrical box (see Image #2, below). If the installer specifies an airtight box (or implements a few simple air-sealing steps), the SlimSurface fixture will leak much less air than most recessed cans. To create a uniform glow, Philips places LEDs at the edge of the fixture, relying on a specially designed lens to distribute the light (what they call their Edgelit technology). This approach is is similar to that used in their SlimStyle LED light bulbs, which were introduced earlier this year. 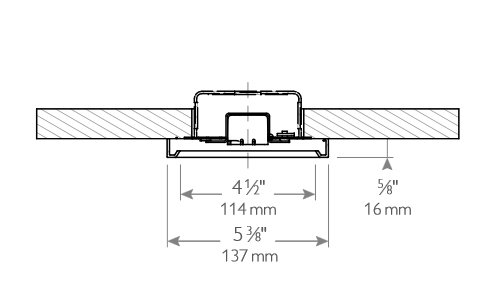 The SlimSurface is available as a square (either 4-inch or 6-inch) or round (5-inch or 7-inch) luminaire. The fully-integrated fixture (the LED itself is not replaceable) is has a rated life of 50,000 hours. The fixture comes in two color temperatures (2,700 K and 3,000 K); two lumen levels (630 and 980); and two color rendering indexes (80 CRI or 90 CRI). It can be dimmed to 10 percent using ELV (electronic low voltage)-type dimmers. The light is also Energy-Star certified, using as little at 10 watts of power and producing 70 lumens per watt. The manufacturer’s suggested retail price for the new light, which will be available from lighting distributors beginning on October 23, starts at $40. Why easier to seal than can-light cans? From the article, it's not clear to me why this is better than a well sealed regular can light arrangement. It's still a penetration in the air-barrier (assuming Air-tight drywall approach). Is it just the size that's the benefit? The fact that sealed electrical boxes are easier to get? 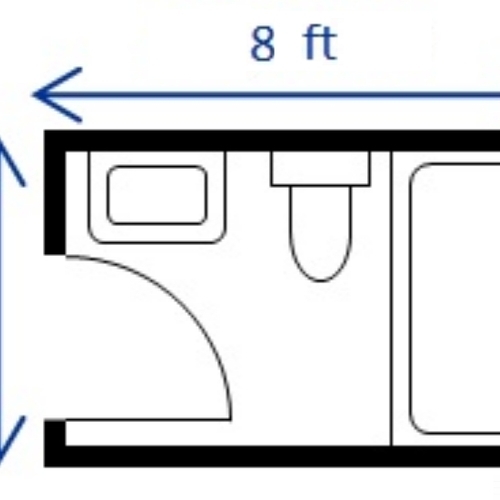 I can see the benefit if you have a small wiring chase/dropped soffit for the ceiling (now you only have to drop 2x4 width rather than 8-10 inches for can lights), but is there more to this? Yes, airtight electrical boxes are available, and they are a much better solution than can lights. And yes, small electrical boxes are much easier to air seal than can lights -- even if they aren't airtight boxes. And it's much easier to install thick insulation above a shallow electrical box than a recessed can. Low profile electrical boxes are even better! There are low profile 1/2" deep electrical boxes that would take essentially ZERO off the insulation depth, give that they are about as thick as half-inch gypsum. They do require some air-sealing, but that's not too tough to do. On galvanized versions the knock-outs and stray hole can be sealed with FSK tape, the wiring with the usual goops. I just finished a project in my home which involved replacing recessed lights in a cathedral ceiling with low-profile LEDs (different than these), and then blowing in cellulose in the whole ceiling. The base case was horrible (want to see where my lights are? Just look for the spots with no snow) to pretty good (given the limitations of the structure). In situations where the available insulation depth is limited, and recessed lights are a done deal, low-profile LEDs are a real improvement. Sounds great. Looks like a good fit for small-closet lighting also----minimal bumps when retrieving top shelf storage items. I wonder if Philips has done all the testing and reporting mentioned in a post on a different blog on this site. I especially wonder if thermal management is a problem for IC applications (like does it limit the life of the LED or whatever?). See below for comment from the other blog. Any details from Philips on this? I think this form factor is the future of residential lighting, and a good solution to the air leak problem. 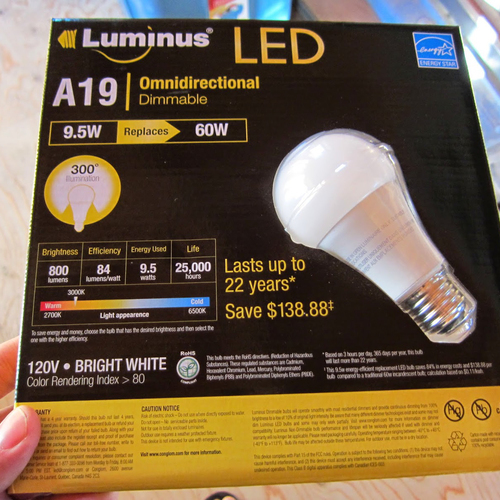 It's a little disappointing that these are 60-65 lm/W when two years ago Philips came out with the 93 lm/W L-prize LED light bulb, which also had excellent color rendering (>90 CRI). It seems that they have decided that consumers see LED and think that automatically means great efficiency, so they don't need to bother doing their best in that regard. There are similar products, not quite as low profile, available from other manufacturers. Although the web page doesn't include pricing information, there is a phone number for more information: 1-866-900-4533. Sorry for the long delay, but earlier this year I ordered a whole house full of SlimSurface lights from LED Source and now have them installed (pending final electric inspection). I would be happy to do a post on the installation, with photos. However, I am not sure how to go about doing this. 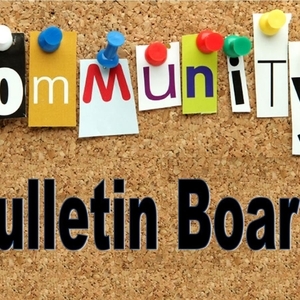 We are always on the lookout for guest blogs. Feel free to contact me by email for more information: martin [at] greenbuildingadvisor [dot] com. Would this work on a cathedral ceiling? I have a new casita with a sloping (4:12) cathedral ceiling from 10'-13' high, and would love to have a tighter seal at the ceiling. Wondering if the light distribution would be even enough on a slope to illuminate directly below. 1. Make sure that your ceiling is airtight. 2. Make sure that you have installed enough insulation to at least meet minimum code requirements. 3. Make sure that you have effective ventilation channels (unless you have installed a code-approved unvented assembly). 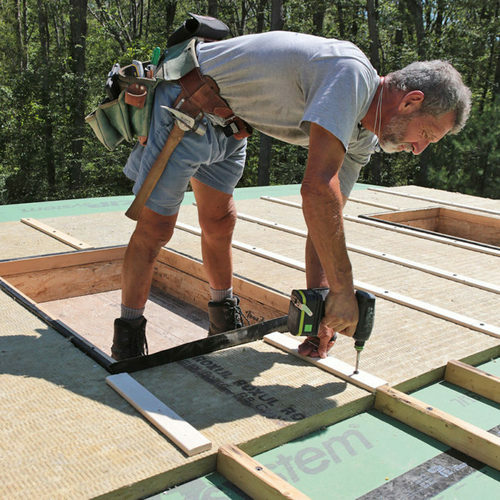 Your plan can work, but you have to pay attention to airtightness. One way to do this is to install airtight electrical boxes. Another way is to modify conventional electrical boxes to make sure they are airtight; this usually involves the use of high-quality tape and caulk. A third way is to install a service cavity. For more information on service cavities, see Service Cavities for Wiring and Plumbing. Is air sealing with caulk good enough, or do you have to enclose the electrical box with an airtight box? (Total of 16 lights). Also, with LED recessed lighting, does the gasket around it provide air sealing? (Electrician says it does). The best approach is to install airtight electrical boxes -- for example, Airfoil boxes or Lessco boxes. If it's too late for that -- and you have already installed ordinary electrical boxes -- you can tighten them up as best as possible with caulk. You'll need to seal any holes in the box itself, including the holes in the back of the box where the cable enters. You'll also need to seal the gap between the electrical box and the drywall. The gaskets around the trim on LED fixtures are better than trim pieces that have no gaskets -- but the gaskets alone aren't perfectly airtight. If you are a perfectionist, perform a blower door test and hold your hand near the box or the trimmed fixture to feel how much air is leaking through each fixture. Wouldn't some spray foam , from above, be an effective easy solution for sealing up the air leaks? This issue is complicated; installing a layer of spray foam directly above a recessed can light may be a fire hazard. For more information on this issue, see Recessed can lights. Did Stu happen to post what his end product was like? I'm very interested in seeing it. Stu actually wrote a guest blog about his lighting adventure. 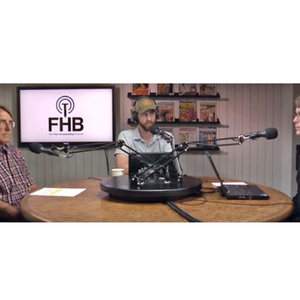 Here is the link: Canned Lighting Conundrum. 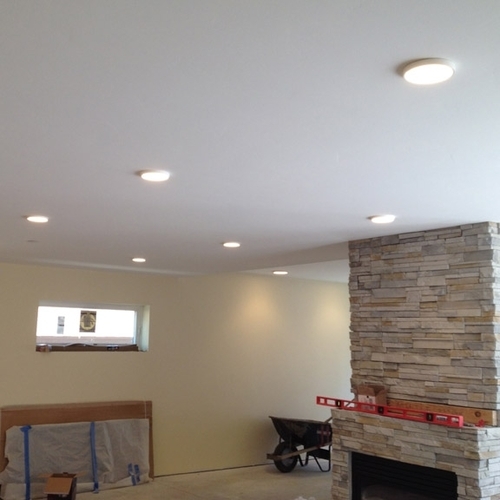 What To Do With All That Recessed Lighting?